Do you want to save a few dollars this winter, maybe for the holiday shopping or vacations? One possible option is to forgo driving and hop on a bike to save gas, insurance, maintenance, or even public transit costs. In this post I will give a few great tips and tricks that can turn winter riding from miserable to fun. There is a reason that fenders are numero uno on this list. Notice on the pretty pink bike to the left, over each tire there is a round cover, that is called a fender. Fenders are critical to keeping you dry and clean when pedaling around on winter roads. They are positioned over the part of the wheel that flings mud, water, and muddy water on to your face, legs and back. While fenders will keep you mostly dry from the wet roads, a rain jacket and a pair of rain pants will keep you dry and warm from the rain from above. Just about any waterproof or near waterproof jacket will do, but since you will be exerting yourself, a lighter and more breathable jacket will be better. Rain pants for cycling can be a little tricky. You will want a pair that can support the range of leg motion required to pedal your bike. Make sure that you can squat down and lift and extend your legs without pressing against any seams or too much fabric bunching. 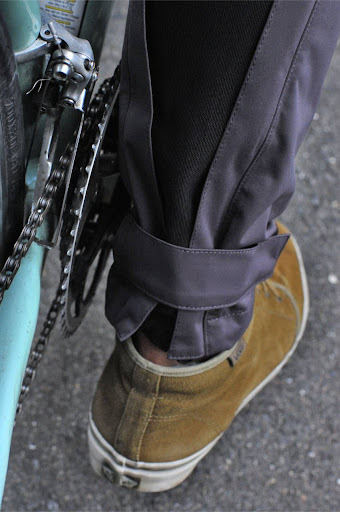 You will also want to make sure that your rain pants (or any pants, really) aren’t too baggy around the ankle/calf area. The extra fabric can get caught in the chain or torn on the sprocket teeth. You can reduce bagginess with the help of rubber bands, Velcro straps, or bungee cords. I highly recommend either leaving a complete (I really do mean complete!) change of clean clothes at your desk or locker at work or school. Another option is to carry a change of clothes in your backpack. Even the most prepared winter cyclist can get caught in an epic downpour or forget their jacket or accidentally run through a 6″ deep puddle and end up much wetter than you would have preferred. Running into a bathroom to change from wet clothes to dry clothes can make the difference between a uncomfortable day and a great day. You know that beautiful street lined with trees that you love riding through? During the rainy months that street becomes a death trap: wet, slippery leaves coat the asphalt, branches and sticks need dodging, and deep puddles form in clogged sewer drains. Just because you bike comfortably down a road during the summer months does not mean it will be equally enjoyable during the winter. On your first couple of wintery rides take careful note of which roads are debris free, have bike lanes that aren’t small rivers, etc. A slightly longer bike ride without obstacles is better than a shorter ride where your well-being is risked. Also, many bike shops have knowledgeable staff members or even clinics that can help you plan your winter biking routes. You probably don’t want water, dirt, and sand flung into your eyes, right? Then you especially don’t want that to happen while you are cruising down a hill at 15mph while atop your two-wheeled steed. Just about any pair of sunglasses will prove to be invaluable during your commute. But the short days might mean you leave or come home in the dark, so you will want to get a pair of clear or neon safety glasses. They protect your eyes as much as sunglasses and can be found pretty cheaply at hardware or outdoor stores. This entry was posted in Saving Money, Ways To Be Green and tagged green, Save money, winter on December 27, 2010 by Jim McKenzie Smith.